The “Lottery Club” Al Filippone Associates at William Raveis Real Estate in Fairfield shate their $2 million CT Lottery prize win on Thursday, Sept. 6, 2018. From bottom row to top, left to right are: Gina Hackett, Libby Tritschler, Liz Lewis, Karen Cross, Susana Chuka, Amy Desel, Christa Cusano, Leann Ratner, Pam Foarde, Vicki Ihlefeld, Wendy Ryan, Amie Lindwall Belile, Nicole Farrell, Amy Hios, Kelli Montinaro, Bob Manware, and Tracie Rigione. FAIRFIELD - And the winner of that $2 million lottery ticket sold in Fairfield is “The Lottery Club,” a group of 31 people who will share the prize. Six years ago, Karen Cross, of Trumbull, organized the “Lottery Club” at her place of work at Al Filippone Associates at William Raveis Real Estate in Fairfield, where she collected the money, bought the tickets and checked the numbers after every drawing. According to a CT Lottery release, Cross received an early morning text alert that a $2 million winning Mega Millions ticket was sold in Connecticut for the Friday, Aug, 24 drawing. When she later learned the winning ticket was sold at Wheels Convenience Store in Fairfield, she kicked into high gear — it was the same place she last purchased group’s tickets. The winning numbers drawn on Aug, 24, 2018 were 1 - 6 - 13 - 18 - 49, Mega Ball 8 and Megaplier 2. Tickets in hand, Cross discovered one that missed the winning Mega Ball number, but matched the first five white ball numbers drawn. Wasting no time, Cross returned to Wheels and scanned the ticket, while co-worker Vicki Ihlefeld, of Fairfield , FaceTimed with two other members of the Lottery Club back at the office. When the congratulatory message “Winner $2,000,000” popped up on the Ticket Checker, they were all shocked. Because the Mega Millions “Quick Pick” ticket was purchased (with another buck) with the Megaplier feature added, the $1 million prize was automatically multiplied by two for $2 million. 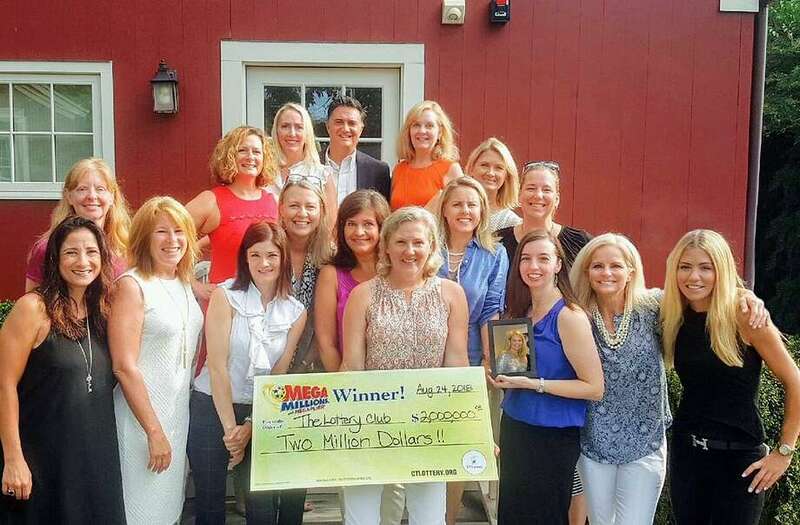 On Thursday, Cross and several other co-workers arrived at CT Lottery Headquarters in Rocky Hill to claim the $2 million prize on behalf of all 31 members of the Lottery Club. Once the prize is divvied up amongst the winners, each will receive $64,516.13 (before taxes). For selling the winning ticket, Wheels, located 2047 Post Road in Fairfield, will receive a $2,500 bonus from the CT Lottery.